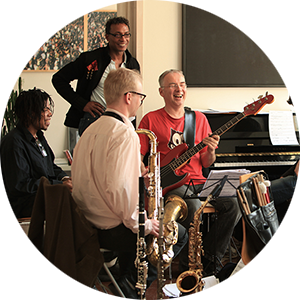 The workshops at the Global Music School take place under the guidance of accomplished teachers and musicians from both Germany and abroad. 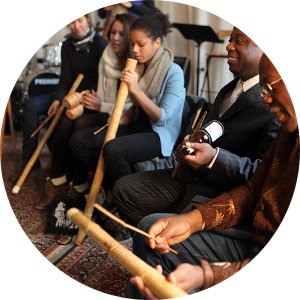 Some of our most memorable past events have been workshops in Arabic music, Afro-Cuban percussion from Havana, flamenco for all as well as Angolan rhythms. Starting in March 2019, several workshop series specially designed to provide an immersion into central aspects of classical Indian dance will be offered. Excitingly unique about the series conducted by Rajyashree Ramesh are, apart from decades of professional experience, her movement analytic approach and the current insights from years of academic research that she brings into these aspects. The time-honoured knowledge on performing arts, Natya, is illuminated from multifarious perspectives, thus enabling a multidimensional approach and practise of the same today. 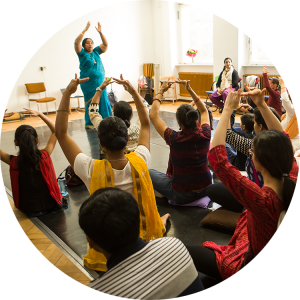 The workshop series are suitable both for Bharatanatyam learners as add-ons to the weekly courses, as well as for everyone interested in the themes being offered, be it due to creative-artistic (dance, theatre, fine arts), pedagogical (teachers, educators), personal or other reasons. No prior dance experience is required. Given every theme constitutes an important and extensive aspect of Indian performing arts, a participation in the complete series for any given theme is recommended. There is, however, the possibility to book single sessions if so desired. Abhinaya is one of the two aspects of Natya, and means taking on and conveying. In the first workshop series “Sprechende Hände” from March till June 2019, we focus on the rich usage of hand gestures, an important aspect of Abhinaya. 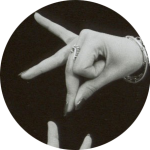 Several hand shapes have been conventionalised through practise and are called gestures. We will explore how a hand shape alone, however, does not necessarily carry meaning, as is generally understood, but using hands in specific ways. Also linguistic properties as well as imagery underlie the traditional creative usage of hands, revealing how thus conveying meaning follows many current insights from gesture research. This series will continue in Autumn 2019 with a second round of the successful CoreConcepts Series developed by Rajyashree Ramesh. Emotive expressivity, the other central aspect of Abhinaya and cornerstone of Indian performing arts, will be explored in this 6-month series as a unique method of locating emotions in the body by means of a systematic approach to subtle and differentiated movement. 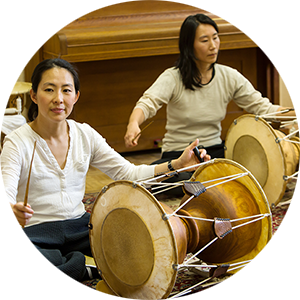 If you are interested in an instrument, singing or dance style and have only a small time window – such as a weekend – we can organize a workshop for you. Just get in touch with us!